PROS: The main advantage of SE4000 is the price. If you only need a moderate amount of amplification and don’t want to spend too much, it’s a decent choice. CONS: The battery life isn’t great, the cord is too short, and you’ll get more background noise than with higher budget alternatives. SUMMARY: The Super Ear SE4000 is an okay choice if your needs are on the lower side. It lacks the stronger amplification and features of some other hearing amplifiers, but the trade-off is that the price is quite inexpensive. **Update- This model has been discontinued and replaced with the SuperEar 5000. 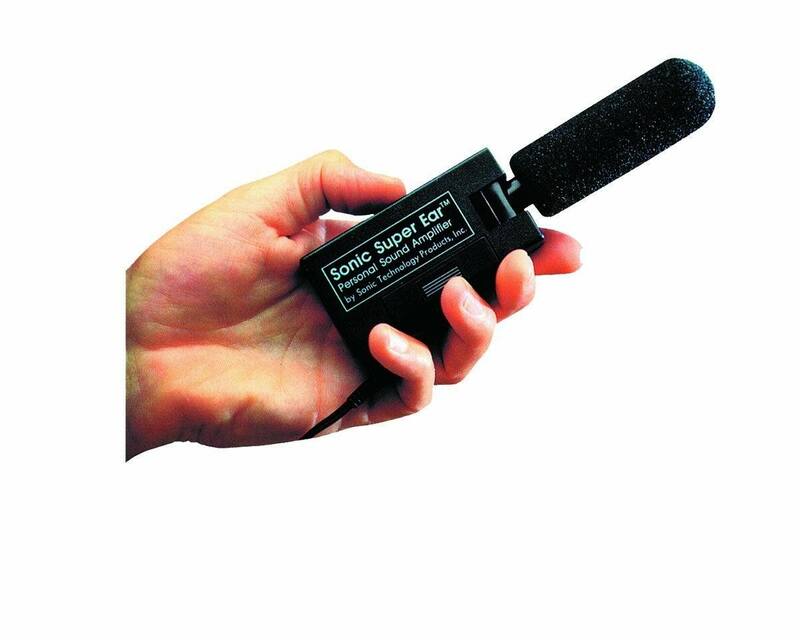 The Super Ear SE4000 is a good budget handheld amplifier that would be useful for anyone who is looking for a low-cost solution for hearing problems in certain difficult hearing situations. It is recommended for slight to moderate hearing impairments to help amplify sound while watching TV, at church, going to the theatre, in doctor’s offices, while in the hospital and when communicating with family and friends. With this device you can get up to 50 decibels of sound gain, helping you to hear sounds that you may have been missing. Overall, it is a great low-cost tool to help the hearing impaired. The device itself is a hand-held amplifier that has a large microphone that you use to pick up sound directly from the source. You just point the microphone toward the sound that you would like to hear. Using headphones that attach to the body of the Super Ear the sound will go directly to your ears. The Super ear is small enough that you can put into a pocket, or you can attach it to binoculars, belts, hats, wheelchairs, and walkers. The Super Ear isn’t the smallest or the lightest of personal hearing amplifiers, and it isn’t recommended for someone who is self-conscious about their hearing loss and who doesn’t want to draw attention to the fact they are wearing a hearing device. The bulky size of the device could work as a positive feature for anyone who is constantly losing small hearing aids or small personal amplifying devices. The headphones that come with the Super Ear aren’t great; a lot of users find them to be uncomfortable and of poor quality, so if you purchase this device you should consider investing in a pair of higher quality headphones or earbuds and if will most likely improve your overall enjoyment of the product. The other small problem with the design of the Super Ear is the cord that connects the body to the headphones is only about three feet long, so you are slightly restricted if you want to put the device any distance away from you when you are wearing the headphones. For the price, the sound quality is okay, although it does have an issue with picking up background sounds that will bother some users. When using a new hearing device you need to give your brain a little bit of time to adjust so once users get used to it, they may be able to get used to the background sound. The Super Ear doesn’t have the sophisticated noise canceling technology that some of the higher end handheld amplifiers have, but for the amount of money you are paying it isn’t bad. One thing that the Super Ear doesn’t have that is a bit problematic, is the ability to adjust the tone and frequency of the sound. When trying to find a hearing device that will work for your hearing loss, it is a nice feature to have the ability to modify the tone and customize the sound, which unfortunately you cannot do with the Super Ear. If you choose to upgrade to a higher end version hand-held amplifier then you can get a bit more customization, although if you cannot afford more, this is a good product. Elderly who are unable or unwilling to wear a hearing aid; or who often misplace hearing aids. People who have trouble hearing when in a group or at meetings (you can direct the mic towards the speaker to amplify their voice). People with hearing loss who aren’t quite ready to get a hearing aid. The Super Ear’s battery life is a bit on the short side. It uses 1-AAA Alkaline Battery that can last up to 30 Hours. Thirty hours would be the maximum amount of time that you will be able to get out of it, which isn’t that long compared to some similar products. If you do buy this product, you might want to think about investing in some rechargeable batteries or just stock up on bulk AAA batteries, so you have them available. There is also no visual indication of when the unit is on or off which could lead to a lot of dead batteries if one forgets to turn it off. You can get an ambient sound gain of around 50+ decibels by using the Super Ear. This quite a high level of amplification, so if you only have mild hearing loss and are using this product, you need to be careful that you don’t damage your ears. The volume control is a simple black plastic wheel with no markers, so it is not possible to recall a previous volume setting. 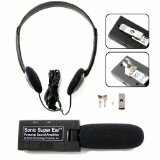 The Super Ear can be used for watching TV, one-on-one conversations, in the car, in nature (hunting or birding). Very useful for the elderly in a nursing home since it so easy to use and can be more comfortable to wear than a hearing aid. If you have trouble hearing in meetings, this will help. Can be used as a stop-gap aid before getting a professional hearing aid or if aids are lost or the user refuses to use them. Can help people in church hear the sermon more clearly. Helpful in family situations like at a dining table or when eating out. The company that makes the Super Ear is called Sonic Technology Products, and they offer a 30-day money back guarantee. They do not refund shipping so you can test it out, but if you send it back, you will have to pay postage. The Super Ear SE4000 has a 3-year limited warranty. Sonic Technology Products have an excellent customer service reputation. You can talk to a customer service representative at 1-800-247-5548 Mon – Thurs 9 am -5 pm EDT, or you can also contact them through their website. Super Ear does what it claims to do, which is it amplifies sound to help people hear in different types of situations for a reasonable price. 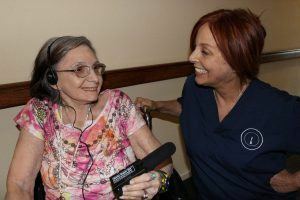 The sound quality could be better, and the device picks up quite a lot of background or ambient noise, but if you have run out of other options and need something that might help a loved one watch TV, have a conversation, or communicate while in a care facility, the Super Ear is worth a shot. You can always return it if it doesn’t work for you (within the 30-day free trial window). The Super Ear SE4000 comes with a belt clip, a binocular clip, and a double-sided Velcro strip that you can use to connect to a walker or a wheelchair. The cost of the Super Ear is around $40, and it’s available in color black only. The cord from the headphones to the receiver is only 3 ft.
Could have a better on-off switch/volume control.